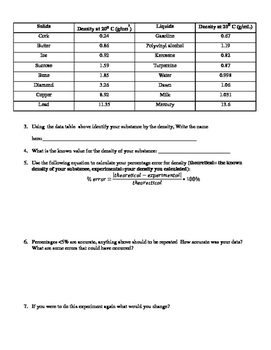 This lab is a great introduction to density. Student's will be able to measure different volumes of liquids and find the mass, which helps them practice using lab equipment. 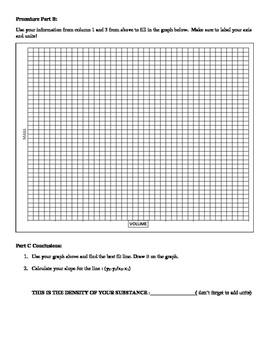 Students will also graph their points, and use their math skills to find the slope. 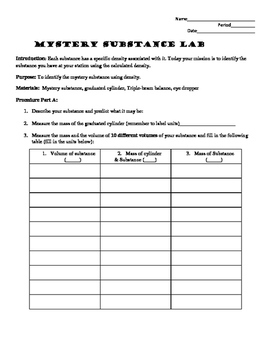 This is a fun lab if you try and "trick" your students. I like to color water and give them material safety data for "dihydrogen monoxide" so that they are extra cautious. Imagine their surprise when they identify the substance and it's just water!